CHANHASSEN, Minn. & NEW YORK–Sunday, August 3, 2014 will mark the 14th running of the New York City Triathlon, New York’s only international distance triathlon. The race, now owned by Life Time – The Healthy Way of Life Company (NYSE:LTM) and produced by its premier endurance events division Life Time Athletic Events, joins the renowned Life Time Tri Series, which currently includes eleven races throughout the country. The New York City Triathlon launched in 2001 as a part of NYC’s Olympic bid effort with less than 700 people participating in the inaugural race. By 2009, the triathlon was selling out in just minutes following the opening of registration, and by November of 2010, due to its immense popularity as the most in-demand international distance triathlon in America, the race began utilizing a lottery system. The lottery for the 2014 New York City Triathlon is scheduled to open on Nov. 1, 2013. More than 3,000 athletes are expected to swim, bike and run through Manhattan’s west side for the 2014 event. John Korff, organizer of the race since it originated, added, “The New York City Triathlon has seen tremendous growth and success over the past 13 years. It began as a small race with a group of fearless athletes jumping into the Hudson River; to one of the marquee events in New York City—and the only international distance triathlon in the state. Looking ahead, Life Time will bring added resources and triathlon expertise to elevate this iconic New York event to the next level. For more information on the Life Time Tri Series, visit lifetimetri.com. Information is also provided on Twitter @LifeTimeTri and the Life Time Tri Facebook page. Founded in 2001 as part of New York City’s Olympic bid effort, the New York City Triathlon has emerged as the most in-demand international distance triathlon in America. During the race, athletes swim 1.5 kilometers (.9321 miles) in the Hudson River, bike 40 kilometers (24.85 miles) on the Henry Hudson Parkway, and run 10 kilometers (6.2 miles) in Central Park. 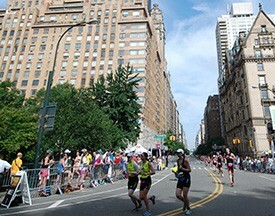 For more information, visit nyctri.com. As The Healthy Way of Life Company, Life Time Fitness (NYSE:LTM) helps organizations, communities and individuals achieve their total health objectives, athletic aspirations and fitness goals by engaging in their areas of interest — or discovering new passions — both inside and outside of Life Time’s distinctive and large sports, professional fitness, family recreation and spa destinations, most of which operate 24 hours a day, seven days a week. The Company’s Healthy Way of Life approach enables customers to achieve this by providing the best programs, people and places of uncompromising quality and value. As of August 6, 2013, the Company operated 106 centers under the LIFE TIME FITNESS® and LIFE TIME ATHLETIC® brands in the United States and Canada. Additional information about Life Time centers, programs and services is available atlifetimefitness.com.